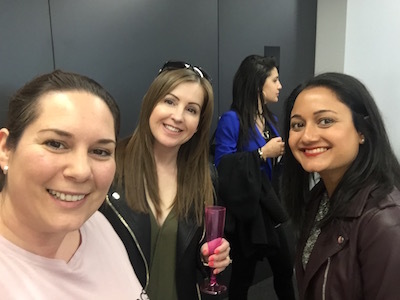 Home Blog Events & Awards	I attended #BlogConLDN blogging event – but was it a good idea? 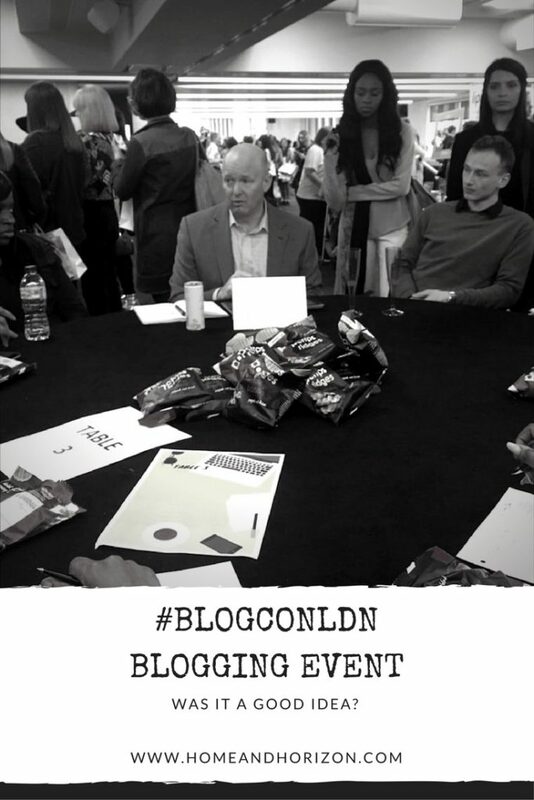 I attended #BlogConLDN blogging event – but was it a good idea? On Saturday 18th March I ditched the family (sorry guys!) in favour of a trip to a blogging event called #BlogConLDN. The event was established by Scarlett London Events and was making its debut in London, following similar events, #BloggersBall and #BloggersFestival. I haven’t been to any of them before, so it was all very new to me – and I was keen to get the inside scoop. My ticket, which I purchased back in January, cost me £13.09 including VAT and we were promised a selection of activities, workshops and guest speakers. In total, more than 400 bloggers were expected to attend. This was going to be interesting…! I took the train to London Victoria and then the underground to St James Park. The QEII building is a few minutes walk from St James Park (or you could walk from Victoria which took me about 10 minutes at a fast pace). On entering I was greeted by a fairly large crowd of bloggers chatting away with each other and made my way to the front of the counter to collect a wristband. It's me (on the left) with Priceless Life of Mine (middle) and Radhika Recommends! Recommends (Radhika) and Priceless Life of Mine (Stephanie)! It was great to see them both – friendly, familiar faces are always a nice touch! As I collected my wristband, we were all told to take the lift and make our way to the second floor. 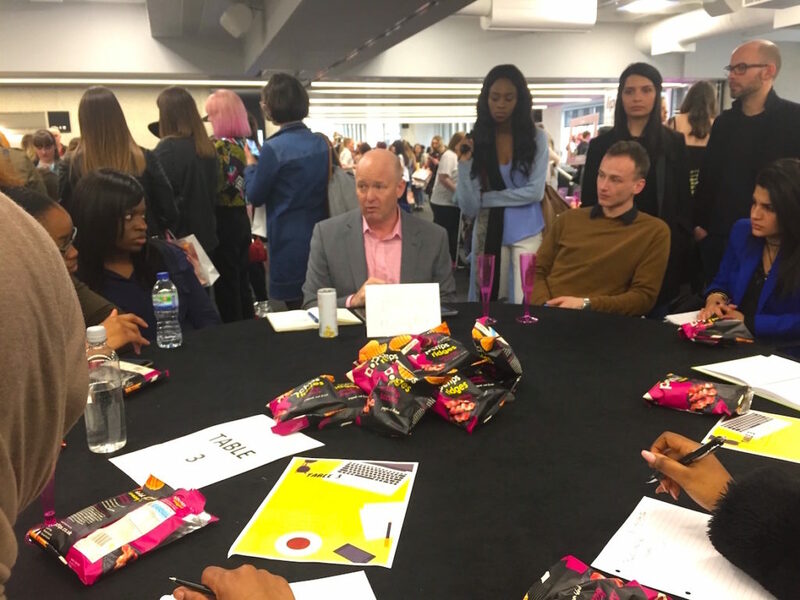 Scarlett told us that the event was relaxed and informal – and to feel free to browse the stands and attend the workshops – which commenced at 12.30. By this time, the time was 12.10pm, so I decided to go for a wander before heading the workshops. 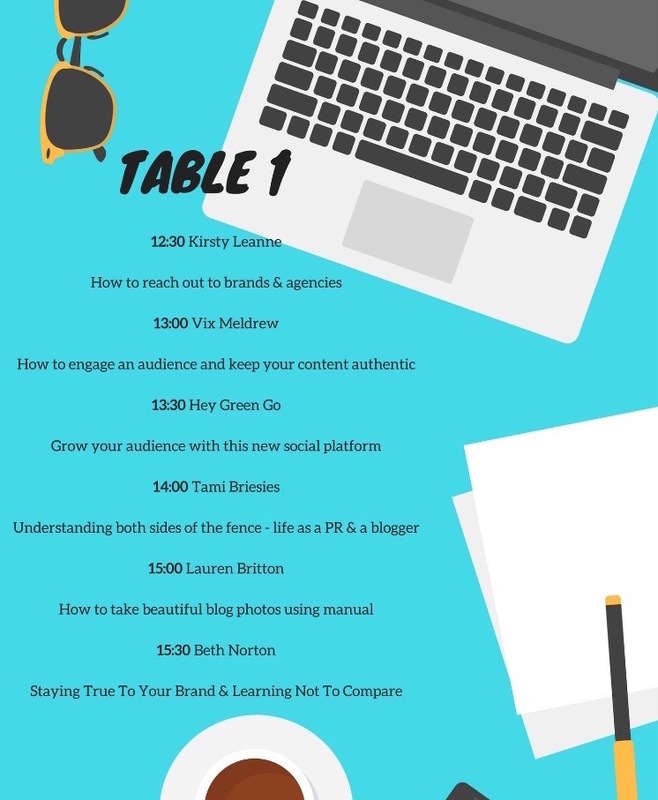 What I love about blogging events is that brands are keen to meet bloggers. I think that far too often companies don’t take the majority of bloggers or vloggers seriously (in terms of a blogger’s ability to be an influencer). I realise this is changing (thank goodness), but it was really nice to see that the different companies I met were genuinely really interested in what I had to offer. And that immediately made me feel welcome and relaxed. I did notice that there were more beauty, fashion, food and health stands than anything else, which didn’t really apply to my blog. So if you’re a beauty or fashion blogger, then you’d really be in your element there. One stand that did catch my eye though was STM Goods, where the girls from Bleat PR were promoting the company’s range of gadget bags, cases and chargers. As I’m a huge gadget fan (see my reviews page), I had to stop for a chat. The accessories were just my cuppa – and featured some lovely colours. I noticed they mixed up the materials on many of the accessories as well which was a nice touch. The stand was running a competition to win a Grace pack and portable charger – all I had to do was have a picture taken in their ‘selfie frame’, so here it is…. 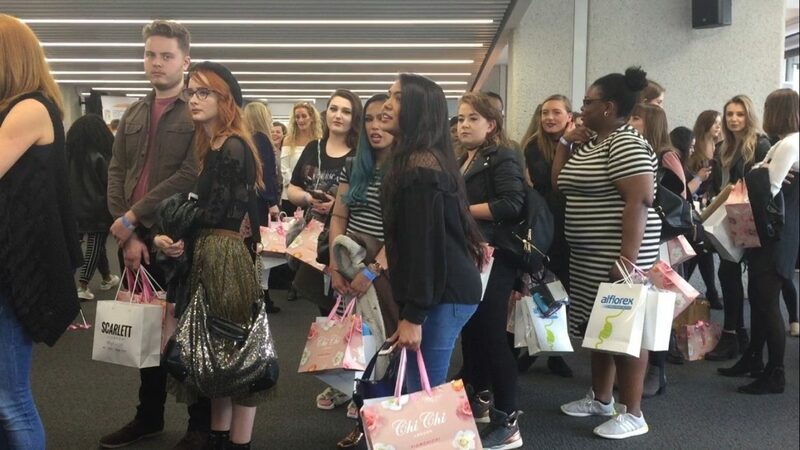 I actually felt really sorry for the Bleat PR girls; they told me that the delivery van with their giveaway boxes for bloggers had failed to deliver the goods – and that the driver was on his way back to Milton Keynes – where the girls had travelled from that morning! I would have been livid, but ever the professionals, the girls carried on with big smiles on their faces (hiding emotions well! ), so I’m hoping that the day was worthwhile for them too in the end, despite the hiccup. You just don’t think of all the things companies have to go through to be at events like this do you? Soon, 12.30 had arrived and it was time to head to the workshops. When I got to the area where Scarlett had pointed to on our arrival, I couldn’t see an entrance to another room; there were just three large round tables (seating about eight people). I was just about to ask where the guest speakers were being held, when I clocked pieces of paper on the tables ‘table 1’ ‘table 2’ and ‘table 3’, and I suddenly realised that the tables were where the chats were taking place. 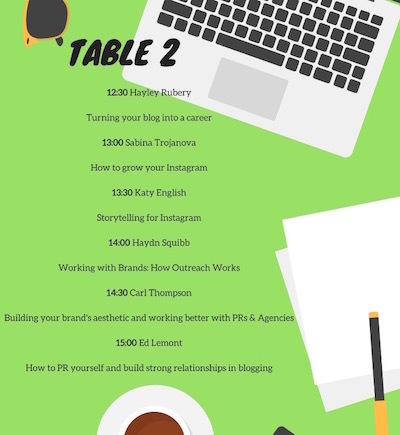 On all three of the tables there wasn’t a free seat and people had started to collect, standing behind the chairs, so I made my way to Table 2 where Hayley Rubbery from Frock Me I'm Famous would be giving a talk on ‘Turning Your Blog Into a Career’. I noticed from the schedule of talks (see pictures below), that most of the talks were for half hour and that you’d move in between them depending on which talk you wanted to listen to – great idea. Hayley warned bloggers that if they were looking to go full time then they should be prepared to have savings, as even big brands can take months (sometimes up to six months!) to pay, leading to cashflow problems. Do you know, I would never have guessed it would take them so long! Treat your blog like a business – get a media kit – and an accountant! Networking is key. In fact, Hayley says that when she attended World Travel Market (WTM), which I’m very familiar with myself working in the travel industry, she bagged herself six press trips! Understand when brands need to pay you – haggle with them, but be prepared to get knocked down. The next workshop I decided to attend was Table 3 and Eric from MyVlogBox was giving a talk on ‘Learn How To Monetise Your Blog’. Eric told us that we need to start thinking about revenue for our blog (rather than just income), as we would then see our blogs as a business rather than a pastime. He outlined the different ways bloggers made money from their blogs via indirect monetisation (such as affiliate links, sponsored posts etc), but said that these were not scalable. Instead, he suggested that bloggers look at direct monetisation of their blogs if they wanted to grow it. This could be in the form of selling a product or service, such as an ebook on their subject. It was definitely food for thought and I’ve already got a couple of ideas on what I could try out. The other point Eric made was to be realistic: “Don’t expect all of your readers to be 100% devoted to your product”, he told us, but rather just a small percentage of devoted fans buying into a message or idea could prove fruitful. After Eric’s enlightening session, I decided that I needed to walk round again. I would have happily stayed to listen to some more guest speakers, but after an hour of standing at the tables I realised that I’d had to get ‘elbows at the ready’ to fight for a seat at the next session and I didn’t have the energy. 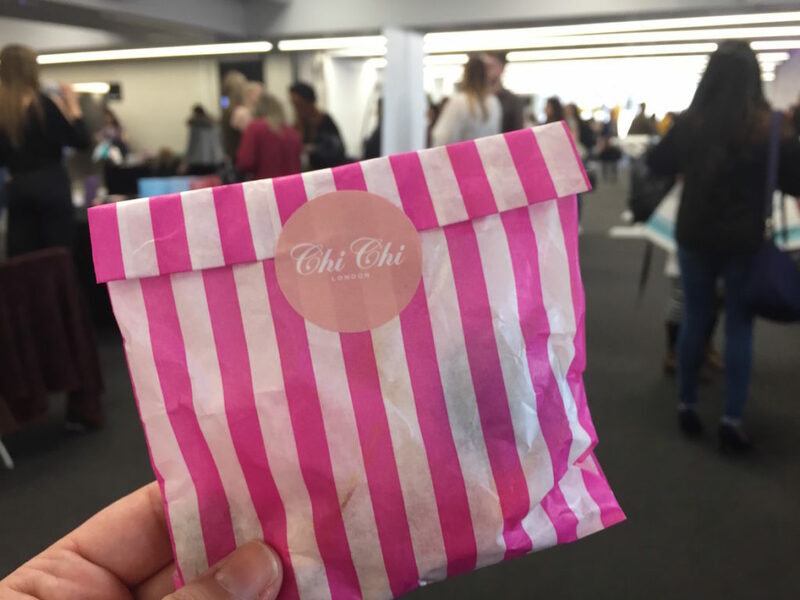 I spoke to a few more brands – and picked up a couple of goodie bags – and then decided that I should probably call it a day. For the price I paid to attend the event plus the train fare, I’d say it was definitely value for money. I’d also say that there’s something for all types of bloggers across all stages…it doesn’t matter if you’re a newbie blogger or a long-time blogger earning a full time wage, there’s something new to discover or learn – and we’re all learning aren’t we? The setup of the talk sessions. It was really difficult to hear what was being said because of the ambient noise. Microphones would not have worked (they’d be competing with each other), so if separate rooms cannot be arranged for next time, then perhaps the tables need to be separated at different ends of the room – and cornered off? This was the event’s debut appearance, so for next time it would be great to see more variety amongst the stands (not heavily weighted on beauty/fashion). Well done Scarlett Events on such a successful #BlogConLDN! I'll be looking out for next year's date – and hopefully I'll be hooking up with more bloggers to say hello – and maybe even grab a cuppa with! This sounds brilliant! Thank you so much for sharing your experience and photos – I really wanted to go but I live in Birmingham so the venue wasn’t practical for me to get to! Loving reading blog posts about the event to get an insight into it! Sending you good vibes! Not sure I like the format of the talks, think there should be rooms and seats for everyone. Looked like a good event though. I’m off to Summer in the City in August – are you going? Hopefully they’ll receive the feedback from this event and take on board the comments for future events. Haven’t heard of the Summer in the City – will check it out though – thanks for the heads up! Hello…sounds like lots of fun! Will make a note of this one for next year! Thanks Ashley – that’s very kind, thanks – love yours too! #bloglove 🙂 Haven’t heard of Blogtacular – but I have now…it’s quite expensive though… will you be going? Sounds like it might get better over time, I will make a note of this one for next year? 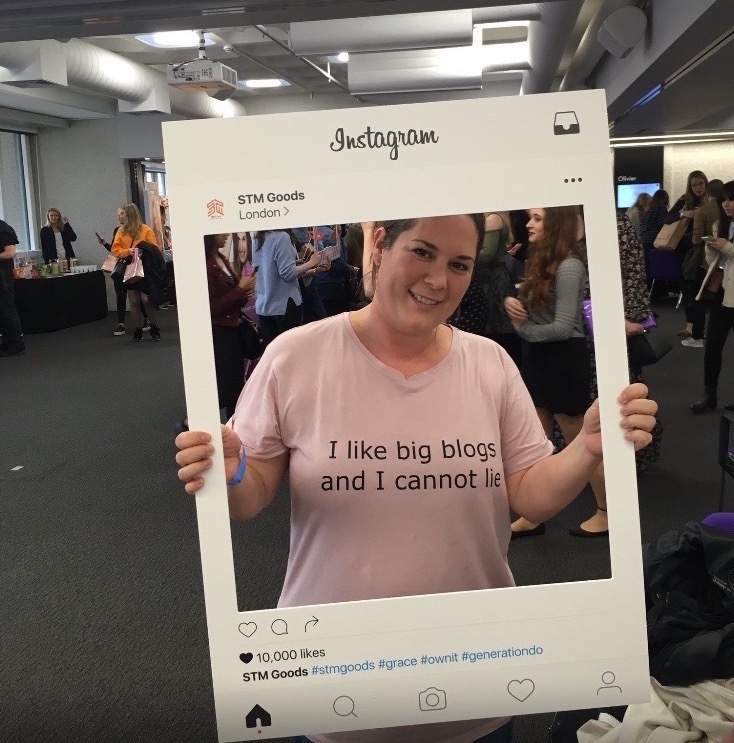 Are you going to Blogtacular? I’ve heard of Blog On so I’m going to check that out! ? I saw a few people were going to this. 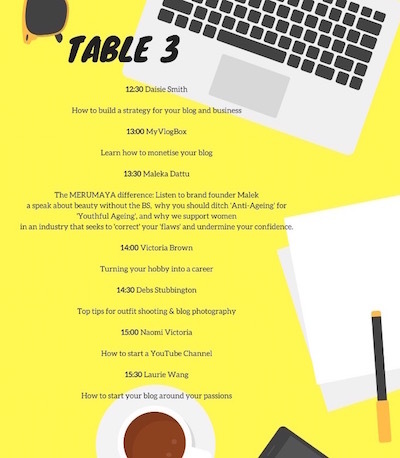 It sounds a great blogging event (though I agree it sounds like the workshops need to be re-thought for next time) I would love to go but living up in Leeds makes it a very expensive trip! I bet! Maybe as they grow they’ll start taking it round the country…? I saw this and wondered what it was all about. Looks like a fab day! Aha Ana – I think I saw you….wearing a black hat? You were surrounded by your fan club I think! If it was you I’m coming over to say hello next time! You looked great by the way – just like your pictures! Not having attended a blogging event before, this really interesting. Great tips from Hayley. It sounds like it was definitely going and great value for money! Such great feedback on the event. I know that brands can take so long to release payment, even with a contractual agreement they can be sloppy and it ends up being a chasing game. Frustrating. Thank you – yes, it must be frustrating!